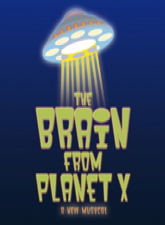 A hilarious musical send-up of bad 50’s sci-fi movies, THE BRAIN FROM PLANET X tells the story of an alien invasion circa 1958. A Brain and its two alien cohorts arrive on Earth with a plan to take over the San Fernando Valley – starting with a happy nuclear family. It’s the first step on the road to their quest of taking over the entire planet and destroying the family unit. This rousing, toe-tapping musical features a dancing, singing brain … what more could you want from a musical?